Most people use billboards to advertise products or restaurants near the highway, but one man made use of the space for another purpose — to get a kidney. Spoiler alert: It worked. Ryan McLennan from Calgary, Canada, says he knew he would need his second kidney transplant earlier this year. The high school teacher was diagnosed with chronic kidney failure in 2002, he told CBS News. His mother donated one of her kidneys to him and he recovered, until recently. Nobody else in McLennan's family was a match — and he worried he would have to wait years to get the organ. "Half of my mind thought it would be 10 years, and the other half thought a miracle was going to come. But, you always gotta have hope," McLennan told CBS News. McLennan says his wife Shakina McLennan had the idea to put up billboards asking for a donor. He was initially reluctant, but after he really began to "struggle" and was put on dialysis, he decided to "give it a try." The couple's advertisements were put up on 27 billboards in Calgary and Edmonton, Canada, in mid-February. The campaign took off. "Ryan McLennan needs a living kidney donor," a billboard reads, "Blood type O." The advertisement lists a phone number and the "Find a kidney donor for Ryan McLennan" Facebook page. 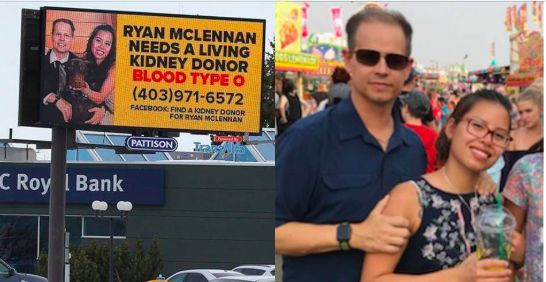 The billboards brought 170 inquiries into the kidney donor program at Foothills Medical Centre in Calgary, Ryan told CBS News. From there, about 50 people applied to donate and 30 underwent testing. Timmons, of Alberta, saw the billboard one day while on his commute to work and called the same night, Canadian news outlet CTV News reports. He was a match, and he agreed to donate his kidney. "There's people waiting for organs that are dying," Timmons told CTV News, "I've got two, so why not?" It turns out that the two men, once strangers, are actually socially linked. Ryan's co-worker brings his child to the same daycare Timmons' family attends. Ryan says the two men — donor and recipient — have hung out about 20 times and that Timmons comes over to his home for dinner "all the time." "I'm just blown away. I've had good friends all my life, but some of them didn't offer. I think it makes it more, just more incredible," said Ryan of the donation. On Wednesday morning, a little over nine months after the billboards went up, Timmons will donate his kidney to Ryan. "It takes a very special person to do this," Ryan said, adding that he is "excited" for the "totally new life" the kidney will bring.